What could be a better fit for Mellow mummy than the rather scrumptious combination of pregnancy and new mum products with natural and organic luxury skincare? Well, My beauty Bundle do just that - little monthly bundles of smellies designed specifically for your stage of pregnancy or motherhood. You can buy a subscription to My Beauty Bundle from £15 a month for 1, 3, 6 or 12 months and each month you will receive a little pampering package of 4 to 5 products tailored to your stage. For me, I like the idea of trying out lots of products I wouldn't normally have heard about and the convenience of having these delivered to me, rather than having to go shopping for them myself. In my bundle I received a Bourjois quick-drying nail varnish, Lavera foot balm, Green Baby one-size baby hat and sample sizes of two luxury products - Madara's ecoface organic deep moisturising fluid and Primavera's rose & pomegranate revitalising cream. I had never tried a Lavera product before and the footbalm is so cooling and rejuvenating that since receiving my bundle I have been out and bought more products from the Lavera range. You can also buy full-size versions of the individual products on the My Beauty Bundle shop if you try out something in your bundle that you turn out to love. I will admit to feeling a little disappointed when I opened my bundle to find the size of the package and some of the samples inside. I know some of the products are seriously expensive but personally I'd prefer to receive a full-sized product of a lower value than a single-use sample of a pricey skincare product. Saying that, I'd probably be even more disappointed if I received a full-sized product that I didn't enjoy using, or wasn't suitable for me so I guess it works out better in the long run and leaves me with the decision about whether to buy more. 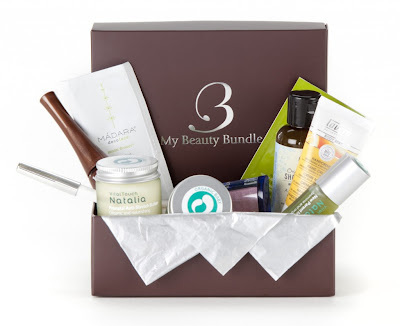 Despite this, I think the monthly pregnancy beauty bundle concept is perfect, particularly as a gift (so, if any of my male readers have got this far through the review then consider this a hint to buy your other halves a subscription when the time is right). My Beauty Bundle features some of my favourite natural skincare brands such as Madara and Weleda and the quality of all of the products is high.